Eventually this will be my contribution to Measi's Band Sampler Round Robin. I hope she's not too overwhelmed by my work! Don't panic, Measi, the next rows are more exciting and prettier too. Finally, on the subject of the Scarlet Letter Year Blog, today I removed all the people who are no longer able to continue stitching with us for one reason or another. Which means we can now offer places to anyone who would like to join us this year. 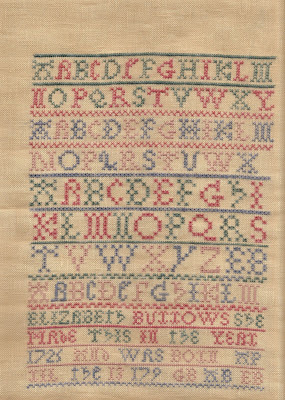 It's very simple, just pop over to the Scarlet Letter website, choose a sampler and stitch-a-long with us. 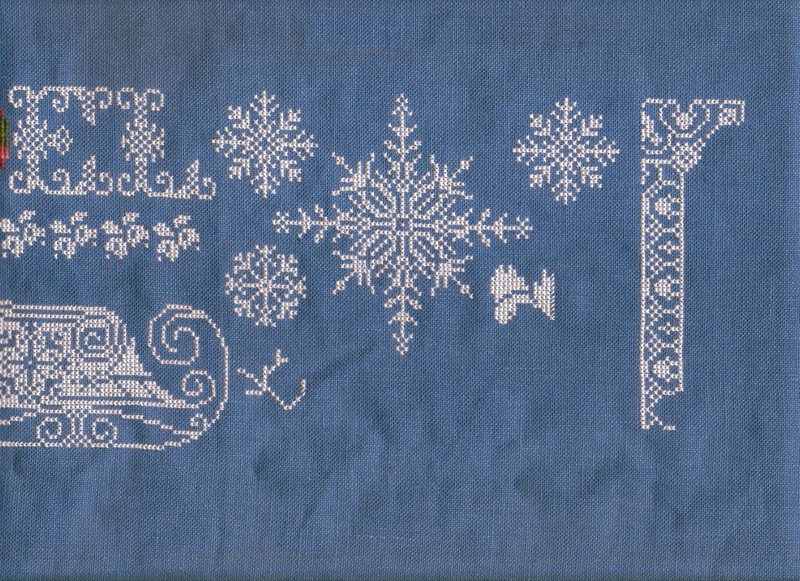 Each completed sampler will be added to The Gallery and at the end of the year Nicola will randomly choose one person to win a voucher. There will also be little giveaways and competitions throughout the year for the contributors. 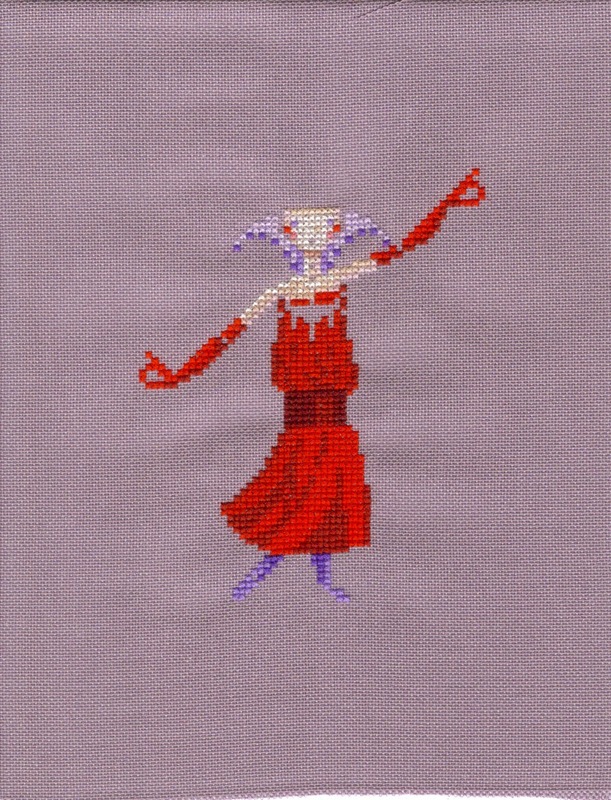 I haven't finished my Vampire for the Hallowe'en SAL yet and I'm now waiting for the metallic black thread to arrive so I don't think it will be done before the end of the month. Lots of progress on this! 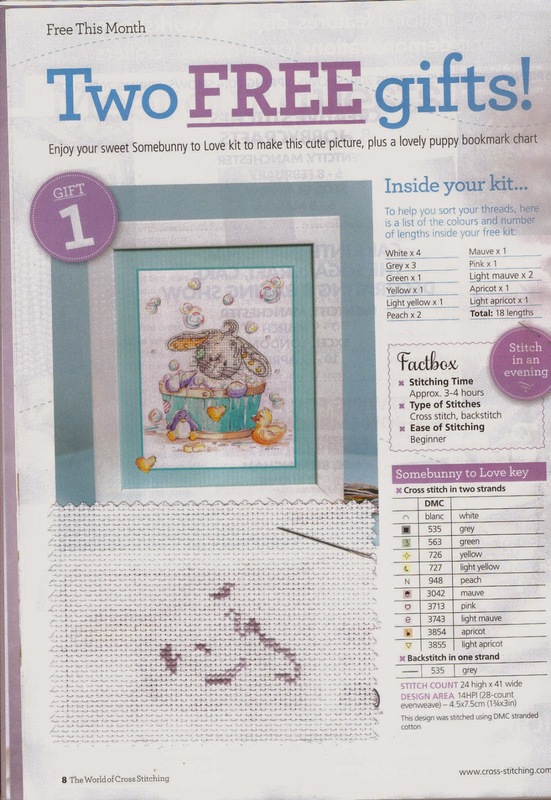 It's the cover kit from WOCS issue 213 a Somebunny design. Stitched on aida. Not my usual thing at all but one of my school mum friends has just had a baby so I thought this would make a nice card for her. Most of the design is printed onto the paper mount, you just stitch the bunny's head. Finally, I have been going through my magazines and have a few that I'm thinking of selling. I've done this in the past and usually get about £3 plus postage on EBay so I thought I'd offer them here first for £3 each including postage or two for £5 or three for (I don't know, I'll work it out!). 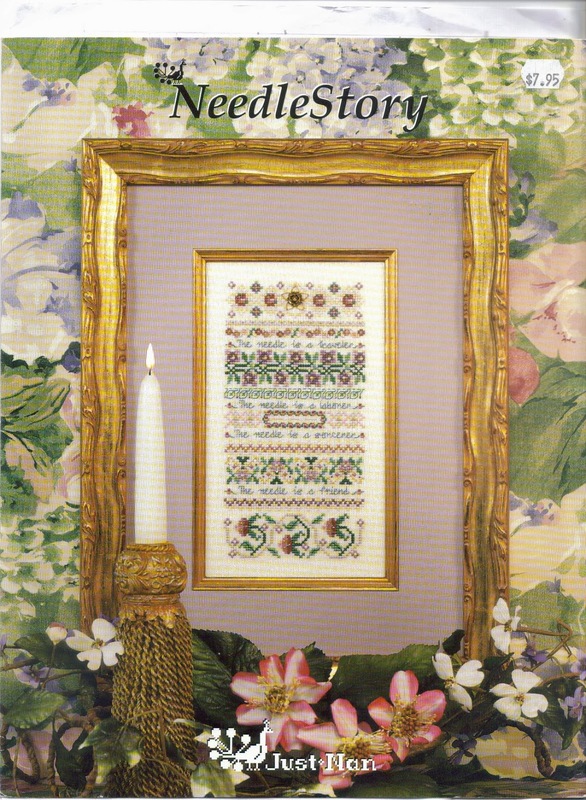 I mostly have Cross Stitch Crazy (2013/14 issues) and Cross Stitcher (2012/13 issues). 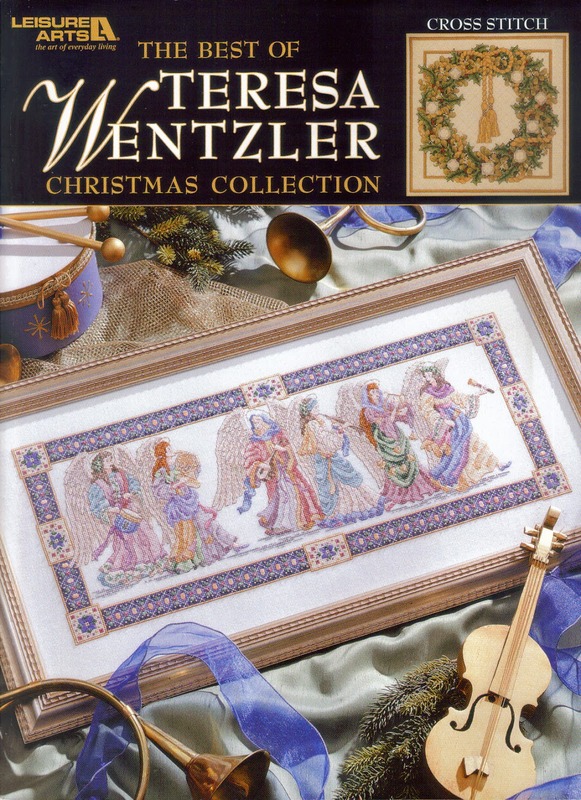 I'd like to hang on to my Cross Stitch Collections and World of Cross Stitching for a little longer but if there is a design you are desperate for then there's no harm asking. The £3 is for UK stitchers only I'm afraid as it costs an unbelievable £7 to mail to the US or Australia! So have a look at my Magazine Contents page and let me know if there is any particular issue you are interested in. The Cross Stitcher mags aren't there but I can scan the contents page if you ask. The idea being to spend as much time as possible during the third full weekend of each month on your favourite pursuit - stitching! This weekend I got LOADS done. We all either have colds or are recovering from colds so from Friday until Sunday we hermitted together. Apart from hubby who had a job on and had to keep us in wood for the burner. On Friday I stitched my piece for the Hallowe'en Ornie SAL blog, this month it's Vampires. When I chose the topic for February I had this piece in mind so I was a little surprised when I pulled the magazine out to stitch her and realised she is supposed to be a witch! Anyway, minus the broom and the dinky little hat plus some fangs she will look alot more vampy. Cheery little block isn't it? Sunday was dedicated to Day One from The Little Stitcher 12 Days of Christmas but I'm saving that for my themed TUSAL post. And on to the Joyous Minuet for Elizabeth Burrows. 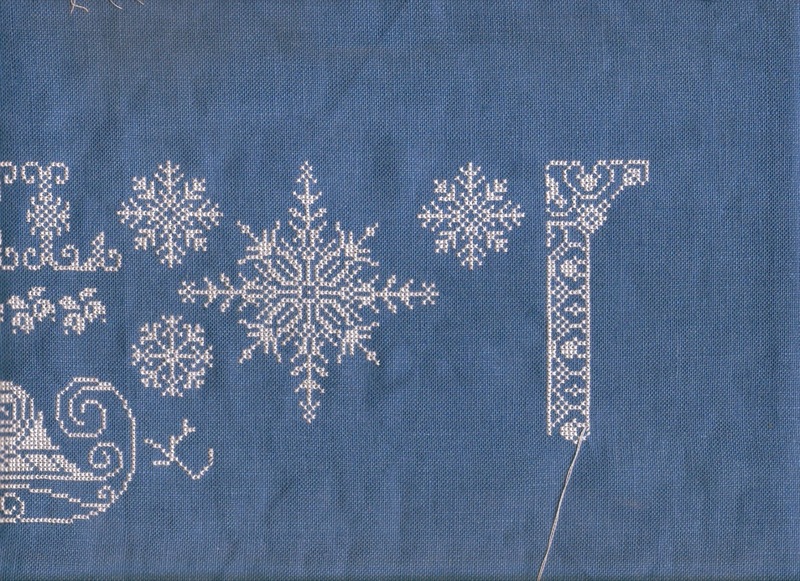 Elizabeth stitched this design in 1725 and the Minuet was a very popular dance at that time so I'm sure she would have skipped a measure or two when she finished her piece. She was only 16 so I'm not sure if she would have allowed to attend dances, or maybe that was considered quite grown-up and time for a match to be found? 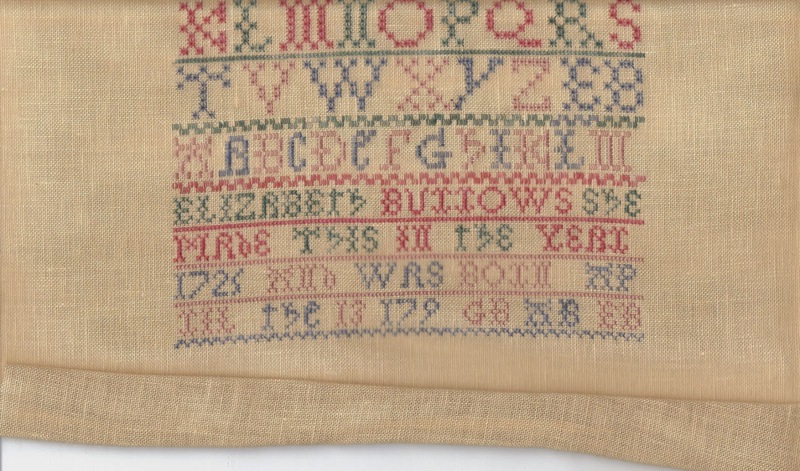 She is quite proud of her date of birth and includes it in the sampler along with the year of stitching. An older unmarried woman may not have done this. I read somewhere or other that many antique samplers have the date of birth unpicked so as not to give away the lady's age to any would-be suitors!! As most of you know I have been assisting Nicola with her Scarlet Letter Year Challenge. 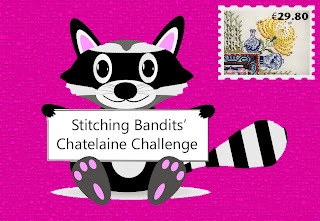 The Challenge officially ends on 20th February 2014 but we will be continuing with the blogs and the stitching because it's such a great group of stitchers. 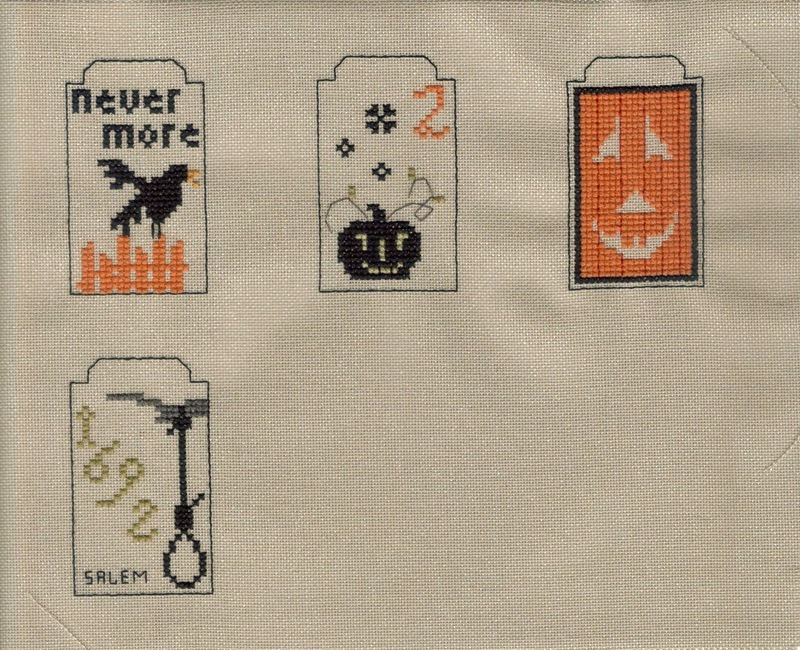 Anyway, there will be a Grand Prize Draw on the 20th for everyone who has completed a Scarlet Letter Sampler during the year. So how embarrassing would it be if all I have to show is one large outlined band and a bit of blue? 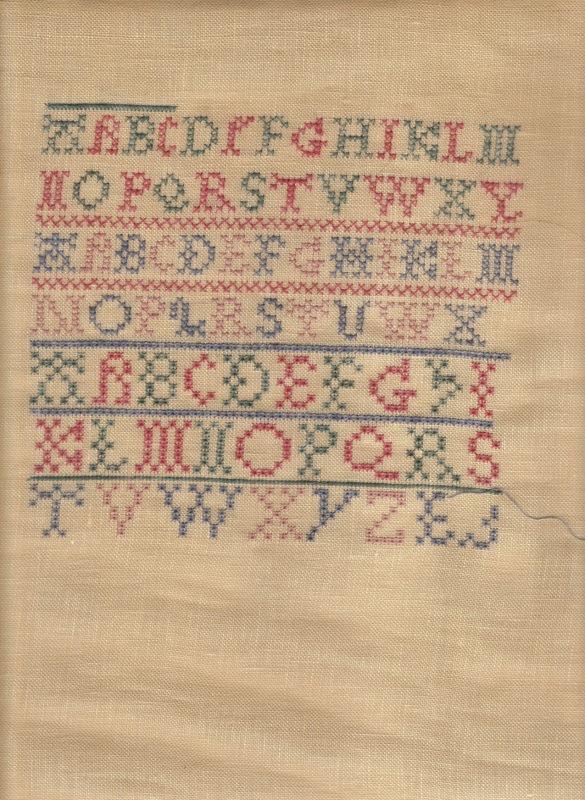 I used the 35 count linen that Nicola kindly provided me for this one and Janet Carsels. The threads are three from Olde Willow Linen Threads which I won in a giveaway from Riona. The fourth is a DMC. I finished this one in plenty of time for the end of the blog, a whole two days early!! The most challenging part was the counting over three for some of the bands. You need to keep a good rhythm going for those. So why not pop over and say Hi to her! The WOCS magazine was an interesting purchase to debate. I subscribe to it already as an allowable expense. 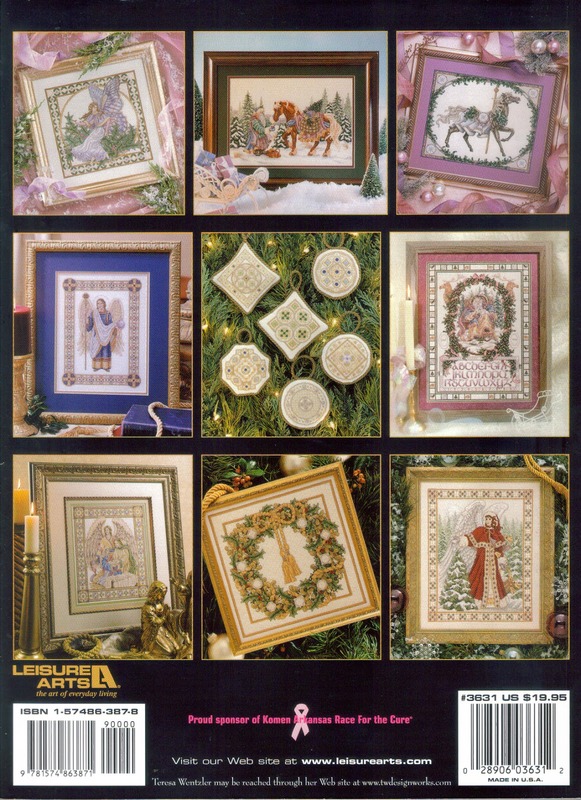 In that particular issue was a Joan Elliott design one of my American friends loved. I offered to buy the magazine and mail it to her in exchange for DMC threads as JoAnn's had a three for a dollar offer on that weekend. So I decided to put the cost of the magazine into my budget to be fair. I already have two of Teresa's books and a number of her charts but this was too good to resist at that price! I haven't received the Just Nan charts yet because they are coming from the States. WIPs and UFOs worked on: Scarlet Letter Elizabeth Burrows (finished), A Mon Ami Pierre Noel Blanc, Primitive Hare Spooky Countdown, The Little Stitcher 12 Days of Christmas. Noel Blanc, a little bird, possibly a robin. The other two WIPs have been shown already and I am saving Elizabeth for a post of her own. Today is Nicola's Birthday and marks the end of the official Scarlet Letter Challenge. We reached the grand total of 160 finishes over the course of the challenge, amazing isn't it? Finally, to be organised I have set up a page just for freebie links here - Themed Freebie Links I have included Valentine's Day, Easter and Hallowe'en so far. Christmas and random others to follow! 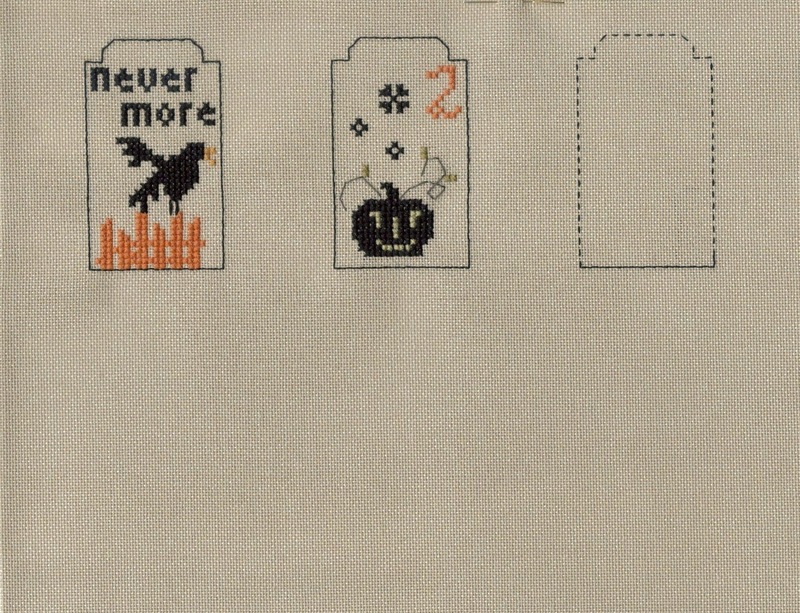 The third block of Spooky Countdown by Primitive Hare was very stitching-intense. Virtually the whole block is stitched so it took a little longer. 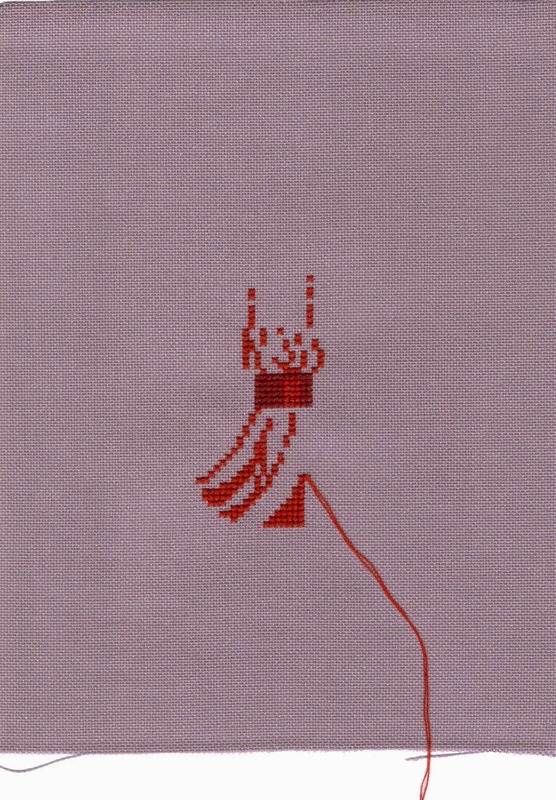 I made one small change, the chart doesn't make it clear which colour the backstitch lines are to be stitched in. The cover illustration is quite small but I could see that the lines were orange. 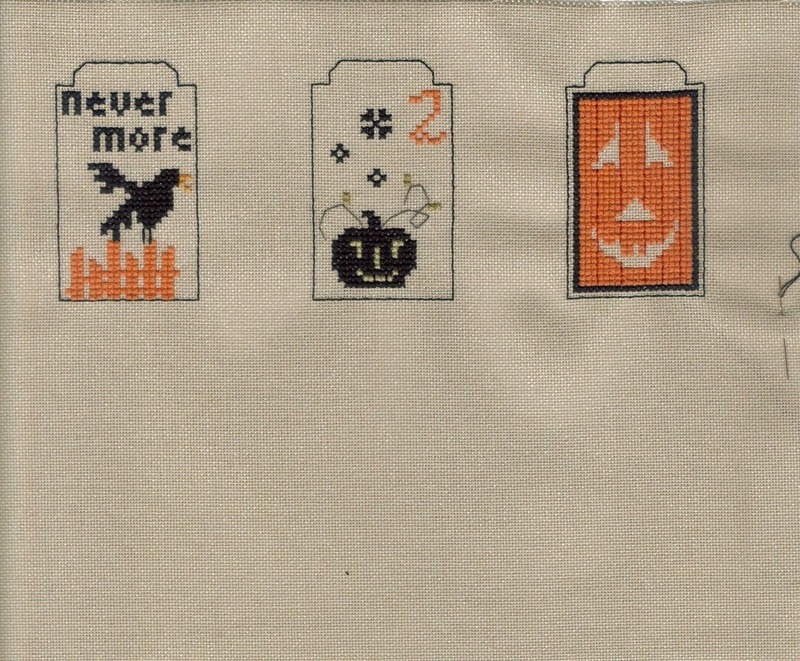 However the only orange listed is 3776 which is used for the pumpkin stitching. So I used 3774 which is a darker orange. I am also making great progress on Elizabeth Burrows for the Scarlet Letter Year Challenge. I have only one row of Montenigren Stitch and I'm done! 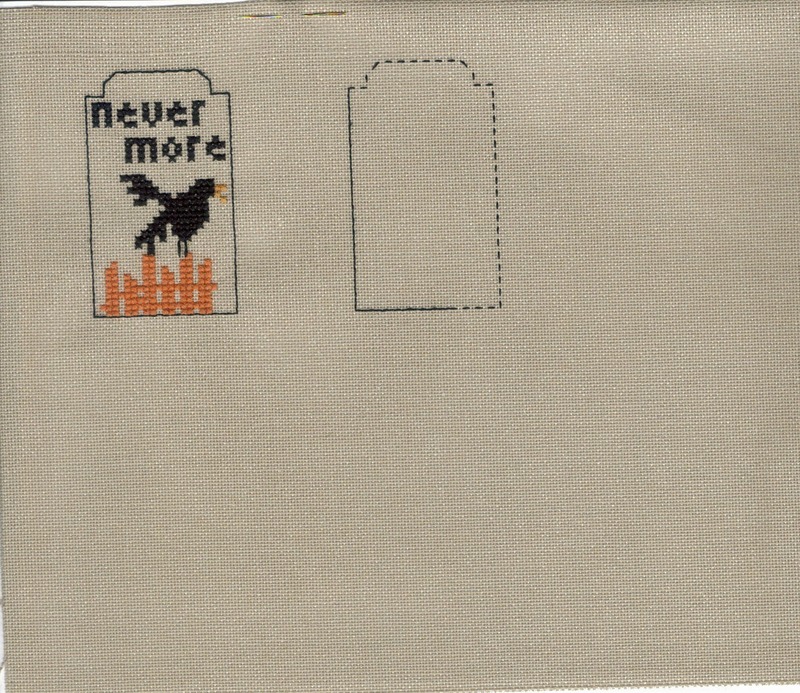 Here is the bottom half of the sampler so I don't spoil the grand unveiling of the finished piece! What confused me was the April split over two lines in two colours! The 179 is actually 1709 but she would have pronounced it Seventeen Nine so stitched it that way. 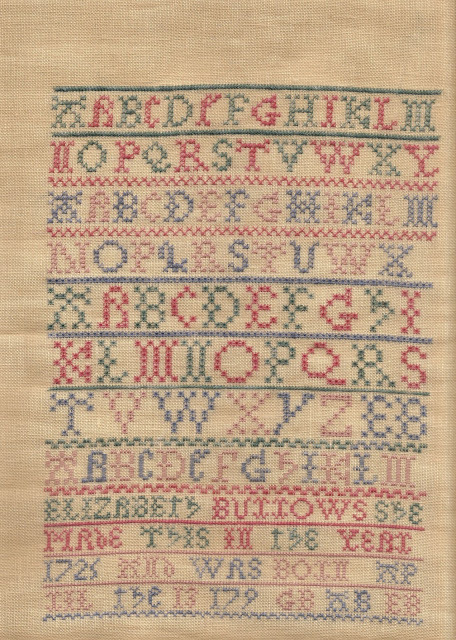 And by coincidence my Birth Date is 17/9 (17th September), this sampler was meant for me! The final three pairs of initials are most likely her family as the all have the last initial B.
February is such a short month isn't it? 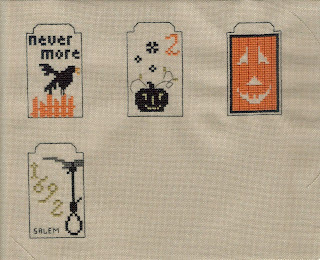 I knew I had to finish this piece by the 20th which would leave the rest of the month for my other stitching, specifically the Little Stitcher 12 Days and the Hallowe'en Blog Hop. But of course there will barely be a week left of the month rather than the usual 10 or 11 days! "How many projects do you generally feel comfortable having in progress at a time? Tell us about your one-at-a-time or rotation habits!" I did rather cover this in my post for 10th February (oops!) but here are some more thoughts on the subject. I used to be a strict OAAT (One at a Time) stitcher. Start one and stitch until it is done. This was back in the pre-internet days when a double figure finish was a good year. Then I discovered the Forums and SALs. I joined in with a Mirabilia Mermaid SAL and then signed up for some Round Robins. And some Smalls Challenges. Before you could say "Serial Starter" I went from 28 finishes (2010) to 77 in 2011 Wowzer!! I have never really got on with a strict rotation system either. Now I make a small list at the beginning of each month with any SALs, greetings cards, obligation stitching etc and then I work through that in order of due date. Any time left over goes on whatever I feel like that day. I'm trying something new with the Noel Blanc piece, just stitching on it while the Small Boy is in the bath. So slow and steady. So far this is working well. I'm looking forward to reading everyone else's replies to the Hot Topic! Finally, the Secret Stitching Sweetheart Blog Hop is on today. Later tonight I will be going round checking all the posts are up. Remember our American friends rise rather later than us in the East so don't panic if some links aren't there yet. Now usually this is one Blog Hop I have to sit out myself because I can hardly send myself a Secret photo! But this year one participant sent two photos and asked me to choose one of them, which I did. I kept the second for me! Any guesses who sent me this lovely design? 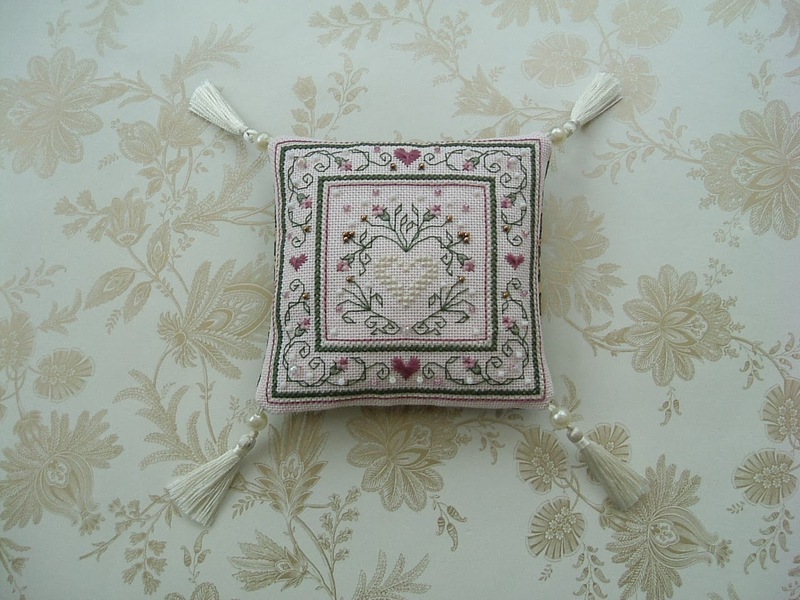 It is a beautiful pillow design from The Sweetheart Tree which made me think it is perfect for my Secret Stitching Sweetheart Blog Hop! Last year I included a list of Heart designs, so here it is again with a few additions! Finally, who can remember these from the 1970s and 80s? 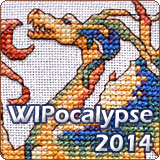 of my three current WIPS. Several people have admired the colours. They are from Olde Willow Linen Threads except for the pale pink which is DMC 152. I planned to use the Olde Willow yellow but it blended into the fabric too much. 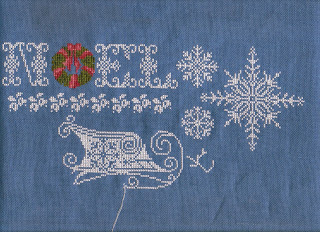 If you look back to the previous post you will see how much I have stitched in four days. Slow but steady! I decided to stay with the 32 count over 2. 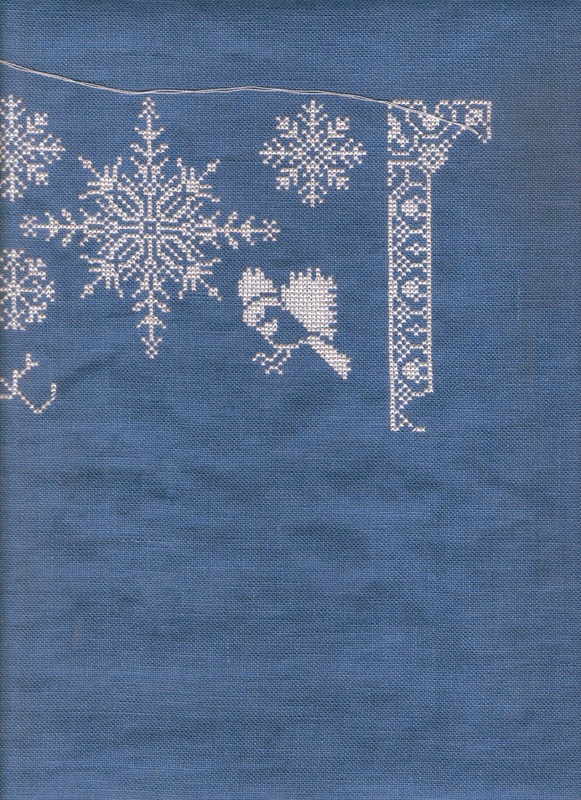 I have changed the DMC 3012 to the slightly darker 3011 when it is stitched alone on the fabric as in the leaves. It looked fine for the face details but didn't show enough against my fabric. I have been keeping a close eye on the Comments to my blog. They are coming in thick and fast so I apologise if I haven't replied to your recent ones. 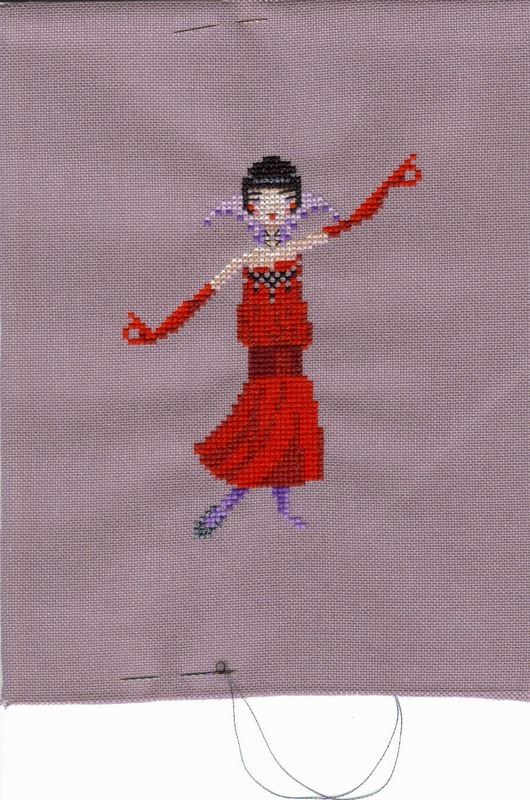 If you said "lovely stitching" please assume I am very grateful and say "Thank You" if I don't get a chance to reply!! Anyway, I recently got my 5000th comment, woohoo!! This came from Gwen of Guava Gems. Gwen is one of our Scarlet Letter Year stitchers and does some lovely stitching, you should check out her First Finish for 2014, a gorgeous mini-sampler which fits into a little tiny tin case. There will be a little something in the post to Gwen. After I finish my SL sampler!! Bizarre - Planet Rock has just started playing a David Bowie track as I was finishing typing that, Life on Mars! Finally, today is the last day to send me your photos for the Secret Stitching Sweetheart Blog Hop. I currently have 13 which would be most unlucky, we managed 14 the last two years! So send them in please! because I don't have enough to stitch already!! I found it very hard to decide which fabric to use, 28 over 1 or 32 over 2. Anyway I started on 32 over 2 and it seems rather large to me. Maybe this weekend I'll do a test piece on 28 over 1 and see how that looks. 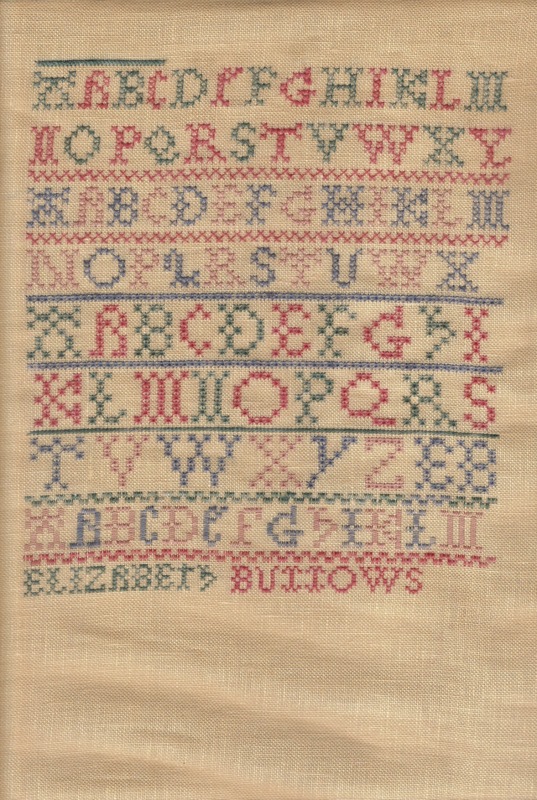 My main focus has been my Scarlet Letter Sampler, Elizabeth Burrows. I really want to finish this by 20th February but it will be pushed to the wire! I do have the 19th off work so maybe I will spend all day frantically stitching and post a finish at 11.59pm. This is the full width of the piece and it is now too wide to fit on the scanner so I have to photograph it. I like this piece alot and have every intention of finishing it to display next Christmas. Famous Friends - WOCS magazine recently featured a link to IHSW on their FB page as a rather brilliant new idea (only slightly spoiled by FB deciding to add the WIPocalypse logo not the IHSW one!!). This raised lots of interest among their FB readers and one lady said she would like to join in but didn't know how to start a blog. Ever helpful I sent her a copy of my "How to Create a Blog" crib sheet. And here is the result - Pam's Stitching Diary. She has posted some of her finishes, including a gorgeous lifelike Alsatian dog. I am not a dog-lover but if I was forced I would have an Alsatian, I think they look like such intelligent animals. Obviously not as intelligent as cats but they are only dogs LOL. 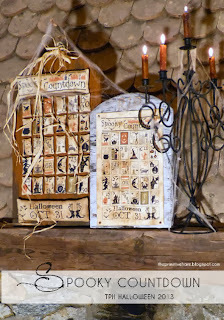 Finally, only three days to sign up for the Secret Stitching Sweetheart Blog Hop. Just send me a photo of something suitable to be sent to another stitcher as a token of friendship/love before 10th February. More details found on the link from the Big Heart to the right of the blog.